One of my favourite pastimes, whether I’m in holiday planning mode or not, is to study maps and destinations and try to work out what would be a possible itinerary for future travels! We were going to be staying a few nights in St Moritz nearly 5 years ago. To finish off our trip, I thought it would be interesting to visit Locarno on the northern shore of Lake Maggiore, still in Switzerland but part of the southern canton of Ticino where Italian is the sole official language. Getting there from St Moritz, whilst not intrepid by many standards, was still a little more complicated than I had bargained for. We caught a train from St Moritz to the little town of Thusis and then embarked on a Swiss Post Bus journey through the San Bernardino Pass (fortunately via a tunnel these days) down into Ticino and its regional capital of Bellinzona. Although the tunnel has greatly improved the communication between the remote Hinterrhein and Mescolina Valleys, you follow the route of the old Viamala, which drove fear into the hearts of travellers of yore. The so-called “Bad Path” took its name back in the middle ages, coined by those traversing this wild rugged terrain. It was the only way to cross the Alps at this point, with their high peaks and deep gorges, and must have felt a remote and godforsaken place – not surprisingly a number of unfortunate folk succumbed to illness, accidents and other mishaps. 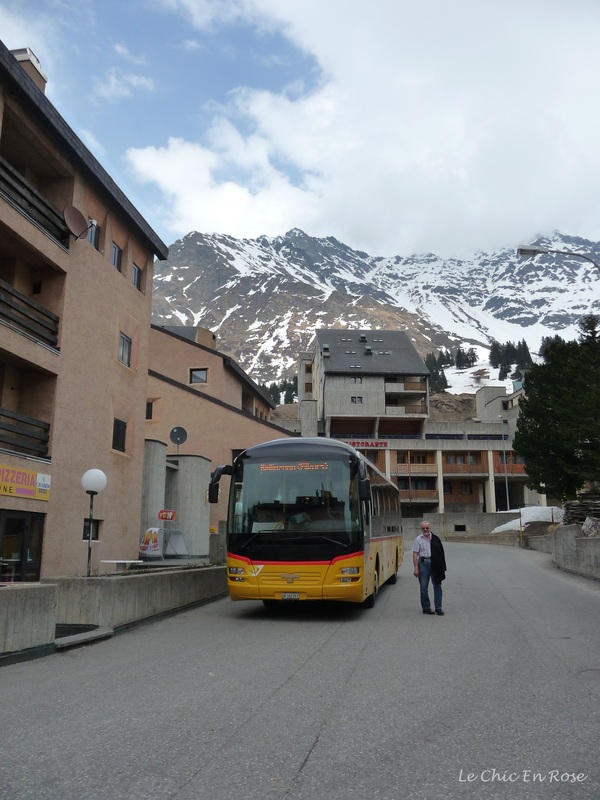 Our Swiss Post Bus in Mescolina having a quick pitstop! Although Italian speaking, this remote valley is still in the predominately German speaking canton of Graubuenden in Switzerland. As it was a particularly wet and rainy day for most of the journey, we were glad to arrive in Bellinzona safe and sound! Here we picked up the local train that shuttles back and forth between Bellinzona and Locarno. Once we stepped out of the station, it was something of a culture shock; the buzz of rapid fire Italian voices, mopeds and cars competing for right of way in the narrow streets and the distinct warmer vibe of a Mediterranean climate! We caught a taxi to our hotel, the Albergo Remorino, checked in, opened the doors to the balcony and were greeted with a wonderful view! The family run Albergo Remorino is actually in the lakeside suburb of Minusio, which is about 5 minutes drive outside Locarno itself. Such a distance did not bother us at all as we were quite happy to walk along Lake Maggiore to and from town, which took about 15 to 20 minutes. There are also regular buses into town, which stop close by the hotel or the hotel staff will provide you with bikes free of charge. The Remorino had a lovely welcoming feel about it and also the most gorgeous breakfast terrace set among lush gardens (which included a pool). There was a slight feel of faded glory about the place, but having checked out the website (see here), the rooms and lobby were all refurbished a couple of years ago and now look effortlessly modern and chic. The ratings have remained high on Tripadvisor too with 4 and a half star approval. 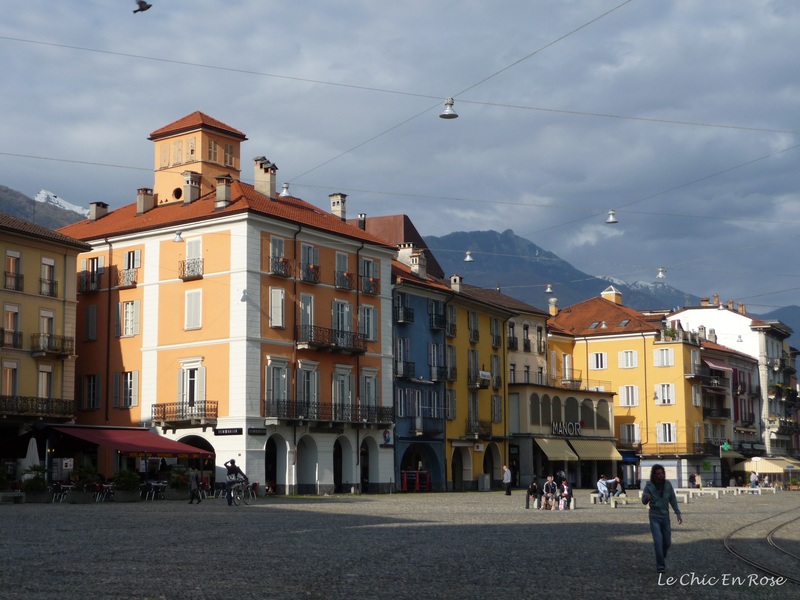 We loved the laid-back feel to the area and preferred to be away from the hustle and bustle of central Locarno. Locarno, whilst still an Alpine town, enjoys Switzerland’s warmest climate and is blessed with over 2300 hours of sunshine each year! It is famous for its annual International Film Festival held in August and the Moon and Stars (pop and rock) Festival held each July. Historically it was the venue for the signing of the Locarno Treaty in 1925 when Germany, France and Belgium agreed to honour the reorganisation of their frontiers, as laid down by the Treaty of Versailles, following the end of the First World War (the pact didn’t last!). Whilst distinctly Italian in language and culture, the Swiss side of Locarno is very evident. The town was immaculate with pristinely maintained gardens and public amenities. There was a feeling of order and routine here too despite our first impressions coming out of the railway station. All paths gravitated to the old centre with the charming Piazza Grande at its heart. In terms of food you’re very much in Italian territory with a multitude of pizzerias and restaurants to choose from. The bars also indulge the Italian habit of afternoon drinks and nibbles with their “Happy Hours” and you can walk everything off with a stroll around the pretty Old Town or along the shores of the lake. One feature we did notice was that whilst Italian is the native language, German was the default second language, not English, which came in third. This southern part of Switzerland is hugely popular with the Swiss Germans who flock here to escape the rather greyer and cooler northern climate, hence the need for the locals to speak German! Menus were in both Italian and German and whilst most hospitality staff had at least a smattering of English, on occasions Monsieur Le Chic had to resort to using his high school German (neither of us speaking any more than a few words of Italian). Since then I have taken up German language classes myself so would be more prepared for future visits though you’ll definitely be able to get by using English – it just may take a little more time with food orders! For more enlightenment on the “lingua franca” in Switzerland see my earlier article here! At the edge of the old town you’ll find the Castello Visconteo, a castle which has its origins in the 12th century. Some of the buildings here were reputedly designed by Leonardo Da Vinci. Although this suggestion made by an Italian historian has yet to be officially proved, the citizens of Locarno are proud to claim the link! An archaelogical museum is housed within the castle walls, although on this occasion we didn’t have the time to visit it, so just had a wander round the old ruins. I should also point out that there are far more direct ways of getting to Locarno than the circuitous route that we took. Direct trains go there from Zurich Hauptbahnhof and as I mentioned earlier in this article, there is a regular rail service from Bellinzona, which is on the main Milan/Zurich rail line. There are also shuttle bus options to and from Malpensa airport in Milan or car rentals if you prefer to drive yourself! Next week we’ll head off by funicular, to visit another of Locarno’s main attractions, the church of Madonna del Sasso in Orselina, which also affords a wonderful lookout point over Lake Maggiore. Ciao for now! Excellent sounds great 🙂 Here it’s a long weekend as there is a public holiday tomorrow and with the start of autumn a bit cooler I always love this time of year! Looks gorgeous Rosemary. We’ve been to Lake Garda and Lake Como but never here – now I can’t imagine why that is having seen your pictures. Very tempting for sure. Love the sound of the hotel too – that balcony view! Also love the sound of being away from the hustle and bustle but a walk by the lake brings you into the town – what could be better! Planning is one of my favourite parts of a holiday – I am also forever making lists of new places and this will go straight on there! 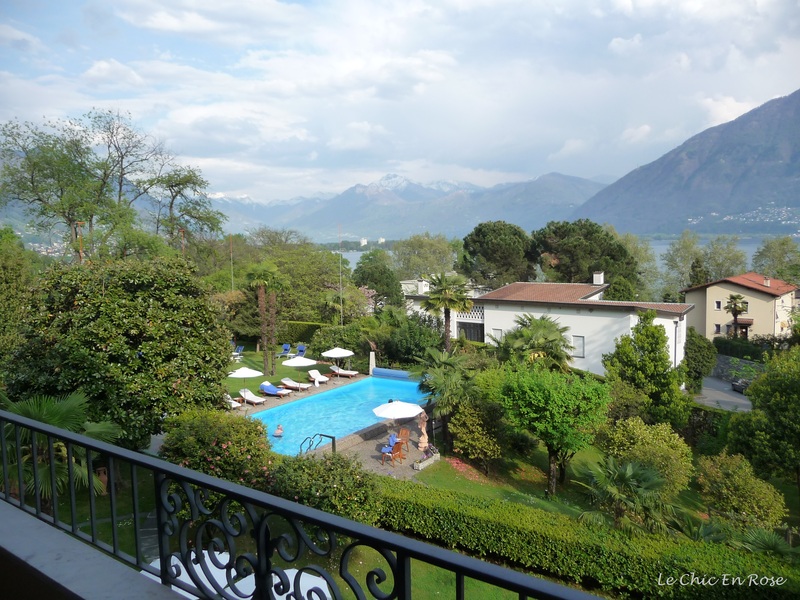 Thanks Joy am glad you liked the post Locarno really is a gorgeous place 🙂 The hotel has been updated since we were there too and having checked out their website I’m tempted to go back there ourselves – still has all the charm but with modernised rooms and wifi which we couldn’t get before. The walk by the lake was also a good way of getting in exercise it was just lovely. We’ve also been to Lake Como but not Lake Garda – they are all so pretty! Locarno definitely has a Swiss German feel mingled with Italian culture, which we found interesting. Am glad I’m not the only one who makes travel lists I am also forever adding possible new destinations! Such beauty as always Rosemary – another place to add to my ‘must visit list. My favorites were the breakfast terrace, the alps behind the city center, Lake Maggiore, and the last photo of Castello Viscateo. Was nice to enjoy a little of Europe before I return to boat work. What a fascinating area to visit! Your photos are just great–the one of that wisteria amazes me. The scenery is so lovely in general! Wow, what a beautiful place!! I am not a person who likes to make plans, but I usually leave and see where the road takes me 🙂 This is how I got in some isolated but gorgeous locations. However, sometimes is good to have an idea about what you want to see. Makes the trip smoother. Thanks for sharing your trip with us! Gorgeous pictures ❤ Have a great weekend!! I wish you a great start to the week. I don’t think we really gave ourselves enough time in Lugano – we only went there for half a day and it was pouring with rain the whole time. The only other visit was just passing through by train en route to Lake Como and we had some time in the station waiting for our train. We need to go back at some point and look round more of the Ticino region! What a beautiful place. Felt like being there right now. Loved the pictures of the lake and flowers. The pool and the garden seems like a relaxing places as as well! I also think it looked so wonderful with the mountains in the back. Wish you a great weekend to come, Rosemary. I think I will be a better planner with time as well! And as you say, when you do not have so much time you need to plan for see as much as possible. 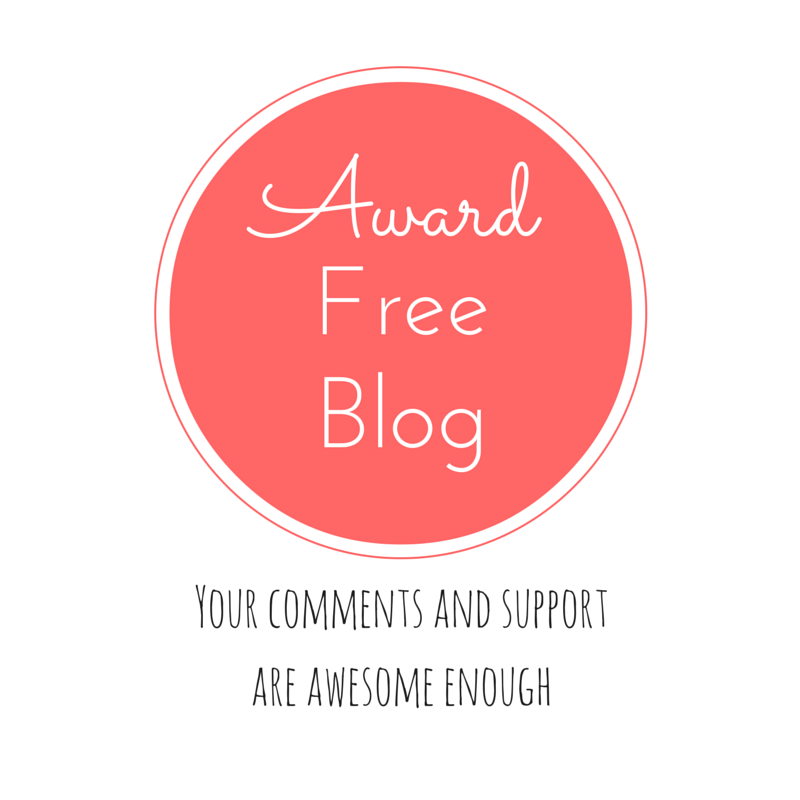 However, if you have time you can take it more as it comes..